And then there were 6... Recapping Week 1 of the NRL Finals for 2012. NOT The Footy Show Episode 125 is short and sharp as host Warrick Nicolson is joined by Matt Trodden and Reece Carter to review Canterbury's win over Manly, Melbourne's icing of Souths, North Queensland rope in Broncos and Canberra send Cronulla packing in Week 1 of the 2012 Finals. We'll be back Wednesday night with our Finals Week 2 Preview with most of our regulars. NOT The Footy Show 26 minutes of what you don't really need on a Monday... or maybe you do. 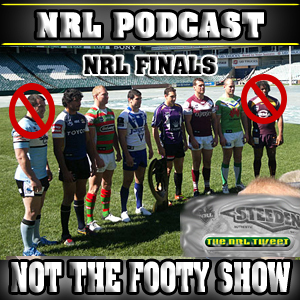 NOT The Footy Show will release another Podcast on Wednesday night - September 12 with our Semi Finals Preview.